Build good habits and skills for personal communication. Inspire others by your caring actions. This is a process that will take time, but it is worth it. Every group has complications with communications – they talk about communication, but are not effective in addressing the problems. Healthy organizations have healthy communication systems. The systems do not happen automatically, but with a lot of planning and evaluation and changes to allow the plan to fit the particular organizations. One size does not fit all! 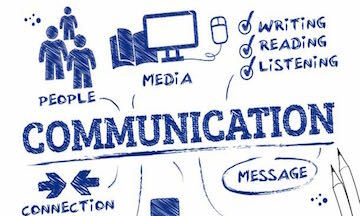 Communication Plan: Defining the communication for specific programs, events, and/or campaigns. Having the best communication system in the world will not work unless the members are skilled in basic communication skills. One reason that the majority of organizations recognize communication as a major issue is two-fold: first, there is no thought-out plan and, second, the people do not have basic skills necessary to ensure effective communication. A program of communication skills training should be included in every leadership training program. The following list of skills is only a beginning for discovering the skills necessary to promote and maintain a healthy communication program. Choose words thoughtfully – use “please”, “would you consider,” etc., and stay away from “you have to understand,” etc. Defining a healthy communication system is the first step. After the system is defined, then, and only then, can a communication plan be developed to fit into the system. The system has three parts: 1. Specific Messages; 2. Channels of Communication; and 3. Who needs to Know – target groups! The messages themselves need to be very specific and complete – what, when, where, sometimes: who and why. There are two kinds of messages, one-way and two-way. Each has a different function and carries a different message. Be sure not to confuse the two functions. One-way messages keep the community informed and aligned on specific activities, functions, and projects. It is essential to keep members up to date on current activities and facts. This builds support and groups energy for the organization. This is not interactive communication. It is informational communication. Examples of one-way communications are date and time announcements for concerts, meetings, fellowship activities, etc., updates on projects, financial updates, and updates on operations such as search committees, construction, financial campaigns, and recruitment programs. Two-way messages encourage input and dialogue from a specific target group. This builds community and ownership for projects and campaigns. More complex issues need two-way conversations and dialogue such as vision and value formation, financial planning and evaluation, program evaluation and revision, and volunteer recruitment. Never use email for two-way dialogue. Some people are not comfortable with computers. Some personalities use the opportunity for personal needs and indirect criticism. Email feedback gives opportunities for and actually empowers passive-aggressive behavior. The same rule applies to surveys. Getting input on issues is an opportunity to engage members in process and build relationships. It is an opportunity for education and ministry for leaders. Using focus groups to gain support and get feedback is far more effective than surveys, anyway. Developing a strong program for focus groups will strengthen any organization by connecting members as stakeholders and flushing out potential leaders. Empower healthy behavior and create healthy systems. An effective communication plan is essential for every program in the organization. For example, when a planning meeting or a long-range plan or strategic plan is concluding, take time to identify the specific messages from that session. Many groups overlook this item because they think it is obvious or they don’t think about this detail. In the absence of information, members make up their own information, which is typically incorrect. So why not give them the correct information? Distributing the specific messages to the correct people builds trust and creates ownership for projects and campaigns, such as strategic planning or a financial campaign. It is important to identify the specific message and, then, who needs to know. Don’t let the process die here. Identify who will send the message and how they will do it. Distinguish messages that are confidential and must stay within the group and messages that need to be distributed internally and externally with the target audience identified. The intentionality of planning communications will not only save time, prevent duplicated or overlooked tasks and hurt feelings (for those feeling left out of the process), it will create interest and synergy within the membership for the process or campaign. How Will They Tell Them? When Will They Tell Them? * Affiliate fees benefit SynerVision Leadership Foundation.